- Another mock draft. 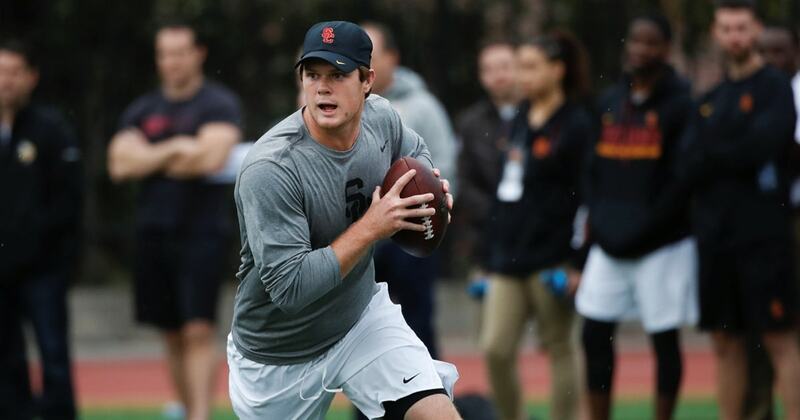 Number 1-- Sam Darnold. Pro day yesterday. Totally solidified it. Cleveland needs a quarterback. They've been looking for quarterbacks. The Cleveland Browns are going to draft Sam Darnold. It's done. Stop arguing on social media. He looked great. It started raining halfway through. He looked better in the rain. I had four friends or associates who were there. They all said the same thing-- he's great. In fact, I was told Troy Aikman was there. And after the workout, turned to somebody-- I think I can say this-- and Troy said, well, Giants are on the clock. OK. Darnold looked great. Big, sturdy, tough. Went 20 and 4 at USC with a bad O-line and some chaos in the program. Arizona is going to call the Giants and trade up, because the Giants now are sending you the signal-- we are rebuilding. We're getting rid of JPP. And we're not doing it for much. We're saving a little cap room. The Arizona Cardinals move up to number 2. They are the only NFC team without a quarterback. They are going to draft Josh Rosen. And they're going to give the Giants a bunch of picks, which is what teams want in a rebuild. That means the Jets, who just moved up about 72 hours ago-- they're going to settle for Josh Allen, who's a bigger, stronger, more durable version of Josh Rosen. So I'm not saying Josh Allen-- I don't think he's ready to start. Rosen's ready to start. Josh Allen needs to sit in New York behind Bridgewater and McCown for a year. They are going to take Josh Allen, who has been the most impressive at the combine and most impressive in personal workouts. He looks like a baby Big Ben. You didn't see Big Ben play in college either. OK? He was at Miami of Ohio. Big, strong, athletic enough. The two prototypes in the NFL for this kid are Paxton Lynch and Big Ben. If he's significantly closer to Big Ben, the Jets have a franchise quarterback. The fourth pick will be Cleveland. There were rumors they like Saquon Barkley. They're going to take him here. Listen-- they basically found a franchise quarterback and a home run hitter out of the backfield. This is going to be a good day in Cleveland. High-profile offensive guys from USC and Penn State. The draftniks are going to go crazy. The fans are going to go nuts. It's going to be a good day for the offense in Cleveland. They'll get Barkley with a fourth pick. Denver picks 5. I think they'd like a quarterback. But three of the ones they really like are gone. So I think John Elway is going to say, you know what? We've got Von Miller. We're going to take the next Von Miller-- Bradley Chubb. If you can get Bradley Chubb with a fifth pick-- a pass rusher in the NFL-- you take him, because a lot of people-- a lot of people think he's going to go to the New York Giants at 2. And I don't think he's going to go to the New York Giants, because when do you sell a house or a draft pick? When the value is greater to somebody else than to you. And if the Giants can get three or four draft picks, that's worth a lot more than Bradley Chubb. Broncos take him at 5. 6-- Indianapolis. Lots of needs. The fastest-rising guy in this draft is Denzel Ward. Now Denver may take him, as well. My Denver and Indy picks could be flipped here. It depends on where Denver goes. They just lost Aqib Talib. They may go Denzel Ward. But I think Denver and Indy either go Chubb-Ward or Ward-Chubb. 7 pick-- Bucks need a safety. Minkah Fitzpatrick is a great one out of Alabama. You're not going to put him on Julio Jones in your division. But he is rangy. He can blitz. He is aggressive. He is a tremendous can't-miss player. Nick Saban gave him great responsibility, even as a true freshman. He was All-SEC Freshman. He can do special teams. He is a tremendous talent for Tampa Bay. Number 8-- Quenton Nelson. Some people think he's the most-- the safest pick in the draft. Chicago is going to get an interior offensive lineman to protect Mitch Trubisky for the next decade. He's a Midwest kid. He's a Notre Dame kid. He is a tough, Midwestern-sensibility, punch-in-the-neck kid. The Bears get a great interior offensive lineman. Buffalo, which doesn't see a huge difference-- I do-- but they don't see a big difference between Rosen and Allen. They're going to draft Baker Mayfield. Miami wants him at 11. They're going to trade up with San Francisco. Now, in our last four mock drafts, we've had them at 9. Buffalo needs a quarterback. Again, I think I would move up on Buffalo and get Rosen or Allen. They're going to have Baker Mayfield, which, in Buffalo, it'll be fun. But, again, he's a small quarterback-- run-around guy in harsh winter weather. I would try to move up more. And number 10-- the guy I haven't seen play, but I've seen YouTube footage and all the, you know, NFL footage-- Marcus Davenport. The Raiders have a bad back seven. The way to help an average secondary is a pass rush. Khalil Mack one side, Marcus Davenport the other. I've been real steady on two picks. Number 1-- Sam Darnold to Cleveland. And number 10-- Marcus Davenport to the Raiders.